I won’t lie, I was a little skeptical putting this film in last night. I love James Wan but he was only the producer. Ghost stories, as everyone here knows are not really my favorite type of film. My wife however loves them, so sometimes it’s entertaining to watch her jump and scream. So after my son went to bed I popped in Lights Out and sure enough about 2min in my wife screamed and jumped. Sadly this woke up my son so we had a nice 10min wait until we could resume. Finally when he fell back to sleep we turned it back on and I began watching my wife get nervous. With every flicker of screen. 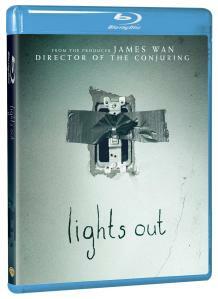 Lights out is the story of a family. Older Daughter Rebecca (Theresa Palmer) young son Martin (Gabriel Bateman) and mother Sophie (Maria Bello) Rebecca lives above a tattoo parlor having moved out years back to get away from her mother. She is called on day by the school councilor about her little brother falling asleep in class. The school could not reach his mom who has been experiencing severe depression and manic tendency’s due to the death of her husband. To make things even worse she has stopped taking her meds which is not good as her late husband was becoming so worried that he was thinking of having her put away to get help. Rebecca takes Martin home and when she asks how mom is he tells her she keeps talking to “Diana”. This triggers something in Rebecca who tells her mom she is taking Martin to her apartment until her mom gets back on her meds. “Diana”, without giving to much away is the name for the evil ghost creature that only appears in darkness. She is mostly viewed as a Silhouette but the shots you see her are in fact very creepy. She drags her feet almost like a zombie but moves at a breakneck pace. Quick fast shots of her face when the lights appear are quite ghastly. She made my wife jump more than once. ‘Diana” first appeared when Rebecca was a girl so she knows all too well what her brother is going through. Throughout the film we learn the origin of Diana, her connection with the family, and what makes her evil. I won’t give any of that away but I will say I enjoyed the back story tremendously. It was, not a shocker by any means, but it was different than the typical ghostly attachment story we have all seen before. Its due to this, and the strong performance of the cast, in particular Maria Bello and Gabriel Bateman as the mom and young son that the film not only holds your interest but allows you to make a connection with these characters. That, and the fact the final act is out of this world in terms of intensity will have you hooked. Even though James Wan was only one of the producers you can definitely see his involvement with the film. The dark, yet at the same time bright colors with every shot, the tight cut scenes and pacing are all used by Wan in his films. The interesting thing is Wan, who loved director David Sandberg’s short film was not convinced that it could translate into a full length film. But Sandberg was able to do it, and on a rather modest budget of 4.9 million dollars. The film ended up grossing 148 million worldwide so it was a box office hit. The Blu-ray looks great crisp colors great frame rate and fantastic audio which is nothing new for Warner Brothers, as they have Blu-ray specs down to a science. The film itself clocks in just a little over 90min, but seems to fly right by. Overall I would have to give this a high recommendation. As I have stated countless times I am not a big fan of films like this as I feel they are all about the same, but the few new twists, the great cast, and the fantastic creepy Diana made this a highly enjoyable film. I won’t lie, it made me jump twice. My wife on the other hand was truly terrified by the end and now needs a touch up on her hair as some of it is now grey.